The fishing season officially opens in Argentine Patagonia on November 1st. Spring is a special time to visit Patagonia as the Andes Mountains still hold a good amount of snow and valleys are covered with spring flowers. Precipitation decreases throughout the spring and average temperatures rise along with the length of day until the summer solstice on December 21st. Area fisheries are full of water, but almost every stream is fishable after December 1st due to the many river-lake systems in our area. Since the water is higher this time of the year, the largest fish tend to be more aggressive and accessible. Fishing is generally spectacular but flexibility is a must as streamers, dry flies, and nymphs are all used depending on the river levels and daily weather conditions. Large flies normally concocted with rubber legs, long hackles, bunny fur, foam–you name it (chernoble’s, garbage, junk, bichos, mutant’s, big foam, etc. )—can be thrown and are very effective this time of the year due to the aggressive nature of the fish and the lack of pressure. You can leave your 5X at home but be sure to bring some 0X and even a sink tip to go down and dirty. Your guide will be as anxious as you are as they have been waiting all winter for the fishing season to open. Tourism season begins after Christmas and the New Year so our area is much more relaxed and the fish are very willing. PRG normally offers a pre-season rate to attract clients during this time, not because of poor fishing, but because the holiday season tends to keep most anglers at home. If you’re looking for a great place to spend the holidays, imagine long days, great fishing, energetic guides, and a very relaxed atmosphere with few people. Fall is the favorite of many anglers, and it is a great time to visit Patagonia. Summer tourist traffic drops off completely and we once again have a vast wilderness to ourselves. Temperatures start to decrease, which normally brings on the fall feeding frenzy of area trout. Brown trout and brook trout are getting ready to spawn and many of those larger fish, which migrated back into the lake during the middle of summer, are headed back to the river to feed or spawn. Fall colors in Patagonia are spectacular and if you are lucky enough to be able to come and enjoy the fall, you will probably become addicted to the beauty, the tranquility and the fishing. Although the days are not as long as the spring and the summer, you still get plenty of time on the water. In fact, you might actually get more fishing in as the guides are excited this time of the year. PRG gets a second wind like no other and scours every last honey hole, secret spot, sure bet, and hog spot to try to catch every last fish before they have to put away their gear for winter. 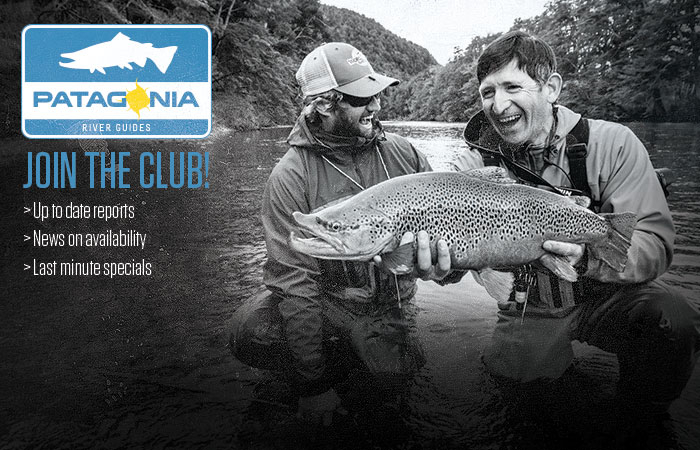 You will enjoy the coziness of the lodges, the fall foods, and the fireside conversations with some of the most passionate fishermen in the world. If you can get a spot, you’ll be thrilled to wake up to cool and clear mornings, fall colors, and snowcapped peaks while getting ready for the ultimate fly fishing adventure that PRG offers!